If Windows starts up but appears sluggish, there could be a variety of causes. There may be a malware infection, or it may not like a recent Windows Update that was installed or a recent driver update. First of all, though, have you tried rebooting? Really rebooting, not just putting your computer into Sleep and waking it up again. To do a full reboot, go to the Start screen, click the Power button, and click Restart. In the Control Panel, choose System and Security, and then choose System. In the navigation bar on the left, choose System Protection. The System Properties dialog box opens with the System protection tab displayed. Click the System Restore button. 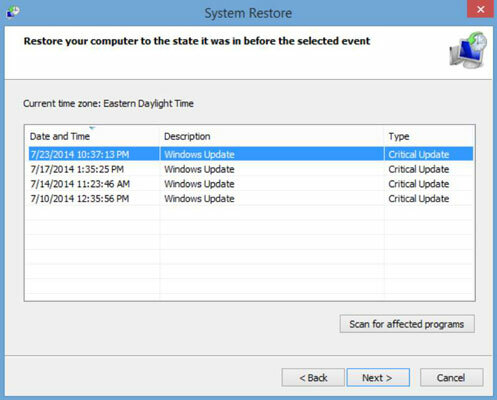 The System Restore utility runs. Click Next. Choose a restore point. Choose one that was saved right before you started having the problem (if you remember when that was). If you aren’t sure what programs may be affected by going back to that point, click Scan for Affected Programs. The results that appear will tell you what you might need to do after the system restore to re-update the things that will be un-updated. Click Close to close the report window. Then click Next to continue. Click Finish. Then wait for the system restore operation to complete. Problem solved? Great. Problem not solved? You might try refreshing your system files. This isn’t a complete reinstall of Windows, and it doesn’t affect your data. It just makes sure nothing is amiss in your Windows installation. On the Charms bar, click the Settings icon, and then click Change PC Settings. Under the Refresh Your PC Without Affecting Your Files heading, click Get Started. Follow the prompts to refresh Windows. If you don’t have a Windows disc, your system probably came with a utility for making a set of recovery discs using your DVD drive and blank DVDs. You did do this when prompted when you first got your computer, right? If you didn’t, you might still be able to. Check your system documentation to find out how.